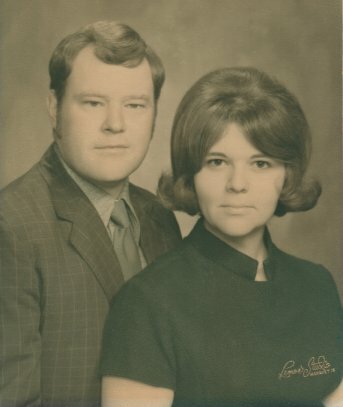 These are my parents in 1970. I'm ever so curious to know what they're smirking about. You're kidding, right? She's gonna marry a guy named "Noggle"? "Okay kids, just hold it for one more second and you can turn the gag jacket and goofy wig back in." "Wow, are we stylin' or what?" I grew up during the 1970s, which quite possibly was the worst era in the history of mankind with regards to fashion and hairstyles. The worst part about it? They ALL thought that they looked great. This is a late comment because I have been enjoying the retired-teacher-traveling syndrome! Six weeks this time. This may not be the proper forum, but...who cares. I'm old and can wear any color I want and can write whatever I want! Ahhh...age. CGH: I did not marry a Noggle; I am Heather's mother, and she looks exactly like me. Relate to Phelps: I am crushed! I spent hours to get that flip to...flip. The toilet paper roll uner the crown took as long to position so that it did not show for the picture. Jim did turn in the jacket, however. PGeek: I STILL look great! HLIN: Really now. Could you have not used the pic where we are running on the beach when the photographer begged us for the release rights? And you shall never know the reason for "the look." Methinks I'd best slink away; I don't think I can deal with two women at this level of hotness, no matter how far away they might be.